203 mm L/60 SK C/344 х 2 pcs. HE Shell203 mm Spr.Gr. L/4.7 Bdz. Initial AP Shell Velocity925 m./s. 105 mm L/65 Dop. L. C/316 х 2 pcs. 37 mm Flakzwilling 306 х 2 pcs. HE Shell203 mm Spr.Gr. L/4.7 Kz. 40 mm L/56 Flak 2818 х 1 pcs. Admiral Hipper — German Tier VIII cruiser. A heavy cruiser that was as good as most ships of this type in terms of speed and armament power. The ship boasted distinct advantages typical of the German Navy ships, i.e. an advanced gun fire control system and a high level of survivability. Those advantages were based on the ship's decent protection, rugged construction, and elaborate subdivision into compartments. Tier VIII's Admiral Hipper is a very capable heavy cruiser. In historical terms, the Admiral Hipper class of cruisers were the most advanced designs ever commissioned by the Kriegsmarine. That legacy translates well into World of Warships: when fully upgraded, Admiral Hipper has a solid main battery, a fearsome anti-aircraft suite, best-in-class German Hydroacoustic Search ( ), and banks of deadly torpedoes on both sides for ships that wander too close. Like other German cruisers, Admiral Hipper’s primary strength is the superior range and favorable dispersion of her 8-inch (203 mm) guns. Her main battery is capable of dealing excellent armor piercing damage to enemy cruisers, but can also deal a surprising amount of damage to battleships exposing their flat broadside to her. The long range (nearly 5.6 km) of her Hydroacoustic Search consumable makes it very difficult to torpedo her from a distance and allows her to actively hunt down destroyers or other ships that might be stationary in a nearby cloud of smoke. Her AA guns are mediocre on her stock hull and Hull (B), but once Hull (C) is equipped Hipper’s AA is a true asset to herself and her team. While Admiral Hipper has many strengths, she is not without faults. Her high explosive shells, while serviceable, will sometimes frustrate and disappoint, and the armor scheme of the ship is highly vulnerable to long-range fire. Her range is excellent by cruiser standards, but any battleship at the same tier or above will significantly outrange Hipper, which — combined with her high detectability (the worst among Tier VIII cruisers) — makes drawing attention early in a match nearly suicidal. With a top speed of 32 knots she's on the slower side for a cruiser, and while her main battery has outstanding range and shell performance, the reload time is notably slower than competing light cruisers. Hipper captains must make every shot count, as cruisers like Mikhail Kutuzov or Edinburgh put shells downrange much more quickly. Admiral Hipper is well-suited to the role of either a second-line long range support ship or part of a flanking group. She truly shines when engaging either other cruisers or a distracted target; if she finds herself dueling a battleship, a smart Hipper captain is advised to hold the range open, find some island cover or friendly smoke to duck behind, and re-engage under better circumstances. Hipper’s large health pool makes it a virtual certainty that she can survive late into games — providing her captain doesn't make any serious mistakes — and it is in the late game that she truly shines, able to flex her varied strengths and contribute to victory regardless of the situation she finds herself in. Largest health pool of all non-premium Tier VIII cruisers (sister ship Prinz Eugen has a few more hit points). Very impressive armor piercing shell damage. Excellent range, favorable dispersion, and high shell velocity from her main battery. Retains access to improved German version of Hydroacoustic Search ( ) consumable. Fastest main battery traverse rate of all Tier VIII cruisers (even those with smaller guns). Angling works well despite relatively low main armor belt value; turtleback armor scheme makes her more resilient to non-battleship AP at medium and close ranges. Hull (C) has an excellent anti-aircraft suite. Powerful torpedo armament; if Admiral Hipper is allowed to deploy her torpedoes, they can be devastating. Only eight (8) rifles in her main battery limits her damage output. Slowest Tier VIII cruiser (32 knots). Heavy torpedo armament is only suitable for close-range engagements and ambushes. Vulnerable citadel via long-range plunging fire (due to lack of deck armor). High explosive shell damage and fire chance are below average (even after the Hull (B) upgrade). Large detection radius makes Concealment Expert and Concealment System Modification 1 ( ) must-haves. Exceptionally vulnerable to long-range plunging fire. Hull: Upgrade to Hull (B) for a minor increase in her anti-aircraft suite, better high explosive shells, a large bump in her health pool, and a 35% improvement in her rudder shift speed. Upgrade to Hull (C) for a significant improvement in her AA armament. Research of Hull (C) unlocks progression to Roon. Gun Fire Control System: Upgrade to FKS Typ 8 Mod. 2 for an extra 10% range on the main battery. Top priority should be given to both of Admiral Hipper’s hull module upgrades. Hull (B) brings nearly a 20% boost to her health pool, an improved rudder shift time, upgraded high explosive shells for her main battery, and a minor improvement in her anti-aircraft suite. Hull (C) drops all of her 37mm Flak guns in favor of the more potent 40mm version and is a drastic increase to her viability as an anti-aircraft platform. The Fire Control System module upgrade can be saved for last. Virtually all builds of Admiral Hipper find themselves mounting Main Armaments Modification 1 in Slot 1 and Steering Gears Modification 2 in Slot 4. After that, captains have some critical choices to make. Concealment System Modification 1 is the most popular pick for Slot 5 in order to help curtail her large detection radius; combined with a captain with the Level 4 skill Concealment Expert, her detectability range drops under 11.0 km. Conversely, Steering Gears Modification 3 ( ) is a strong option in the same slot for captains who prefer quicker rudder response. Captains with access to either Hydroacoustic Search Modification 1 ( ) or Defensive AA Fire Modification 1 ( ) are encouraged to plug those in Slot 2 depending on which consumable they opt to equip. The upgrade in Slot 3 is largely dependent on how captains intend to invest commander skill points on Admiral Hipper and the role they want her to fulfill in a given game. Generalist Build: The easy choice for Slot 3 is Aiming Systems Modification 1 ( ), which improves her shell dispersion and provides a minor buff to her secondary battery. This is the recommended pick for captains who don't wish to specialize the ship in anti-aircraft defenses. Anti-Aircraft Build: Admiral Hipper’s already outstanding AA suite can be made even more potent by equipping AA Guns Modification 1 ( ) in Slot 3, and maximized by assigning a captain with Basic and Advanced Firing Training, providing excellent anti-aircraft protection for herself and teammates when utilizing Defensive AA Fire ( ). This does mean sacrificing the exceptional German Hydroacoustic Search ( ), however, and is a setup that is largely wasted in games without an aircraft carrier present. Admiral Hipper prefers to hold opponents at arms' length. Brawling is not recommended unless the situation is heavily favorable, and the skills of her commander should be tailored to such a strategy. At this end of the German cruiser line the ships begin to play — and handle — more like small battleships, and players will frequently find their commander skill choices echoing those popularly found on battleships: Priority Target at Level 1 and Adrenaline Rush at Level 2. Concealment Expert is also highly recommended at Level 4, as is Advanced Firing Training for captains pursuing an Anti-Aircraft Build. Level 4 also offers Manual Control for AA Armament to captains wishing to go all-in on their Anti-Aircraft Build; this is a very strong skill for high-tier German cruisers and battleships due to the AA potency of their dual-purpose 105mm guns. Level 3 is where captains are offered some customization in their build. Captains preferring the Anti-Aircraft Build will want to opt for Basic Firing Training. Those pursuing the Generalist Build are better off opting for Demolition Expert; Vigilance is also a decent choice. Given her visibility and need to preserve her hit points for the late game, captains are encouraged to invest in Damage Control Party II ( ). The choice between Defensive AA Fire ( ) and Hydroacoustic Search ( ) depends largely on how her commander's skill points are invested. Captains who have heavily invested into the Anti-Aircraft Build may wish to go all-in with Defensive AA Fire II ( ), or shore up their vulnerability to enemy torpedo strikes with Hydroacoustic Search II ( ). Conversely, captains who opted for the more Generalist Build approach can likewise go either way depending on who their division-mates are. 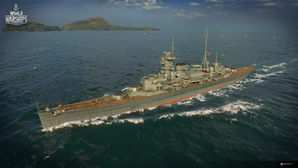 Players who wish to spend doubloons can equip Admiral Hipper with Type 18 camouflage that lowers her detection radius, reduces the accuracy of incoming shells, reduces her repair costs, and increases the amount of experience she earns. Admiral Hipper captains that are focused on progressing up the line will want to tailor her equipped signals to maximizing her experience gains. As such, Red Dragon ( ), Equal Speed Charlie London ( ), and Hydra ( ) all earn hefty recommendations. Sierra Mike ( ) will help improve her average speed, while Anti-Aircraft Build captains will want to throw on November Echo Setteseven ( ) as well. India X-Ray ( ) and Victor Lima ( ) are also recommended to increase the fire chance of her high explosive shells against angled cruisers and battleships. Admiral Hipper underway in 1939, location unknown. The design for Admiral Hipper began under the limitations of the Treaty of Versailles. Because Germany was forbidden from constructing heavy cruisers under the limitations of the treaty, the actual building of such ships was — in the early 1930s — politically undesirable. Planning was, however, impossible to prevent, and a design commission was authorized. In June 1935, the Anglo-German Naval Treaty was signed and Germany was authorized to build ships within a 35:100 tonnage ratio to Britain, though Germany was still to remain under the restrictions enforced by the Treaty of Versailles. At the time, Royal Navy possessed total cruiser displacement of 146,800 tons, which provided the Germans an allotment of 51,380 tons for cruisers of their own. The justification for the Admiral Hipper class was to be found under the terms of the First London Naval Treaty which limited cruiser displacement to roughly 10,000 tons per ship for all signatory nations. 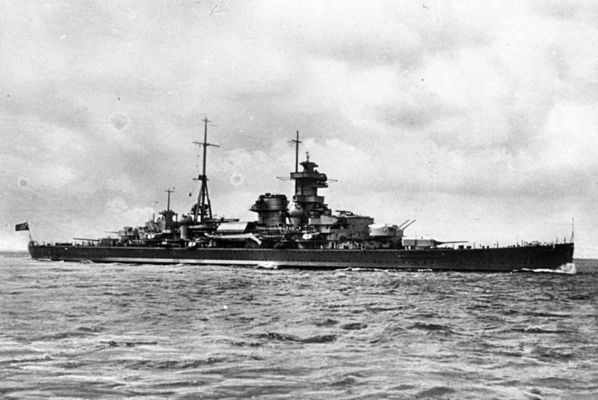 Though Germany was not a signatory to the First London Naval Treaty, the restrictions under Versailles made the construction of heavy cruisers politically dangerous for Germany and cruisers over 10,000 tons even more so, thus construction of the planned five cruisers of the Admiral Hipper class was begun in secret until the abrogation of the Treaty of Versailles removed that necessity. The design requirements for the Admiral Hipper class required the ships to be comparable to the French Algérie class, faster than the Dunkerque class, and capable of long range operations in the Atlantic Ocean, while still within 10,000 tons limit. While smaller, less politically dangerous designs with diesel or turbo-electric propulsion and 150mm to 190mm guns were initially considered, the final design settled on high pressure steam propulsion and 203mm guns. While the officially stated displacement would be 10,000 tons, the actual design displacement of the Admiral Hipper-class would exceed 14,000 tons. Having settled the specifics of the design, the first two ships of the class, Admiral Hipper and Blücher, were laid down in 1934 and 1935 respectively. Prinz Eugen was authorized in late 1935 along with two more ships — Seydlitz and Lützow — and laid down in the spring of the following year. Admiral Hipper was named after Admiral Franz von Hipper, commander of the German battlecruiser squadron during the Battle of Jutland in 1916 and later commander-in-chief of the German High Seas Fleet. Admiral Hipper saw a significant amount of action during the war. She led the assault on Trondheim during Operation Weserübung; while en route to her objective, she sank the British destroyer HMS Glowworm. In December 1940, she broke out into the Atlantic Ocean to operate against Allied merchant shipping, though this operation ended without significant success. In February 1941, Admiral Hipper sortied again, sinking several merchant vessels before eventually returning to Germany via the Denmark Strait. The ship was then transferred to northern Norway to participate in operations against convoys to the Soviet Union, culminating in the Battle of the Barents Sea on 31 December 1942, where she sank the destroyer Achates and the minesweeper Bramble but was in turn damaged and forced to withdraw by the light cruisers HMS Sheffield and HMS Jamaica. Disappointed by the failure to sink merchant ships in that battle, Adolf Hitler ordered the majority of the surface warships scrapped, though Admiral Karl Dönitz was able to convince Hitler to retain the surface fleet. As a result, Admiral Hipper was returned to Germany and decommissioned for repairs. The ship was never restored to operational status, however, and on 3 May 1945, Royal Air Force bombers severely damaged her while she was in Kiel. Her crew scuttled the ship at her moorings, and in July 1945 she was raised and towed to Heikendorfer Bay. She was ultimately broken up for scrap in 1948–1952; her bell resides in the National Maritime Museum in Greenwich, England. Blücher’s career in the Kriegsmarine was much shorter and far less distinguished. Commissioned in the fall of 1939, her first combat assignment was Operation Weserübung in April 1940, loaded with combat troops as the flagship of the force assigned to capture Oslo. While proceeding up the Oslofjord in the pre-dawn hours of 9 April, she was struck by both Norweigan coastal defense batteries and torpedoes. She sank with the loss of nearly 400 men, and the flotilla she was commanding failed to reach Oslo. The Norwegians salvaged both of her anchors; they are on display today in separate locations: one in Oslo, Norway and the other near Drøbak. Prinz Eugen, conversely, was the lone ship of the class to survive the war afloat and intact. She acquitted herself well throughout the war, participating successfully in Operation Rheinübung and the Battle of the Denmark Strait, Operation Cerberus (also known as the "Channel Dash"), and various gunnery support missions in the North and Baltic Seas. Surrendered to the Royal Navy on 7 May 1945, she became a war prize of the United States Navy and was subsequently sailed to the Philadelphia Navy Yard and stripped of some of her equipment — notably her radar and two of her forward gun barrels — before being transferred to the Pacific for Operation Crossroads. Prinz Eugen survived both atomic detonations but was severely irradiated. After being towed to Kwajalein Atoll, the ship began to take on water and list heavily. Attempts were made to keep the vessel afloat, but all were unsuccessful. On 22 December 1946, the ship capsized in the shallow waters of the atoll where she remains visible today. A handful of artifacts from Prinz Eugen have survived into the modern era. The US Navy salvaged one of her propellers in 1977, and presented it to the German Navy League in the summer of 1979. It is on display at the German Naval Memorial in Laboe, Germany. The ship's bell was removed before she was sent to the Pacific to participate in Operation Crossroads; it resides in the collection of the National Museum of the United States Navy and can be viewed in the Washington Navy Yard in Washington, DC. One of the guns removed from turret "Anton" prior to the ship being sent to the Pacific for Operation Crossroads remains in the archives of the Naval Surface Warfare Center ballistic testing facility in Dahlgren, Virginia. Seydlitz was laid down in 1936 and launched in January 1939, but fitting out work on her was halted upon the outbreak of war on 1 September 1939. She was estimated to be 95% complete at the time. She languished close to completion until early 1942, when the Kriegsmarine — having come to appreciate the importance of aircraft carriers after the loss of Bismarck in May 1941 and the near-loss of Tirpitz in March 1942 — elected to resume work on Graf Zeppelin and convert Seydlitz into a light aircraft carrier. With a complement of ten (10) Bf109 fighters and ten (10) Ju87 dive bombers, she would have fulfilled a role similar to that of the Royal Navy's HMS Hermes or the US Navy's Independence class. Work was halted on this conversion in June 1943 and never completed. Seydlitz was transferred to Königsberg, Germany, where she was scuttled on 29 January 1945 to prevent her capture by Soviet forces. The Soviets eventually re-floated her for salvage; she was broken up for scrap in the late 1940's. Lützow was the last Hipper-class cruiser to be ordered. Originally designed as a light cruiser variant of the Admiral Hipper armed with twelve (12) 150mm guns, the German admiralty made the decision to match her main battery to that of her sister ships in November 1936. Her keel was laid at Deschimag in Bremen on 2 August 1937 and she was launched on 1 July 1939. In October of that year, the Soviet Union approached Germany with a proposal to purchase Lützow in her current (unfinished) state, along with all of her technical specifications, trial and testing data, and spare parts. The sale was concluded in February 1940, and Lützow was towed to Leningrad on 15 April. On 25 September 1940, the Soviet Navy re-christened her Petropavlovsk and began work to finish her outfitting. Language barriers and other issues hampered efforts, and arrangements were made for Soviet and German officers to train together aboard sister ship Seydlitz as she worked up towards commissioning in the fall of 1941. The German invasion of the Soviet Union in June 1941 put an end to such collaborative efforts. Petrapavlovsk participated in the defense of Leningrad in August 1941 as a floating battery, but took so many return hits from Wehrmacht heavy artillery that she was forced to beach herself on 17 September to avoid sinking outright. She was re-floated a year later, repaired, renamed Tallinn, and assisted in breaking the Siege of Leningrad in 1944. She was never fully completed, serving as a floating barracks and a stationary training ship before she was scrapped sometime during the 1950's. The wappen (coat of arms) of Admiral Hipper. The wappen (coat of arms) of Blücher. The wappen (coat of arms) of Prinz Eugen. The launch of Blücher, 15 August 1936. Admiral Hipper fitting out at Blohm & Voss, 1937. The launch of Prinz Eugen, 22 August 1938. The launch of Seydlitz, 19 January 1939. Commissioning ceremonies aboard Admiral Hipper, 29 April 1939. Admiral Hipper with original bow and coat of arms, seen in the Kaiser Wilhelm Kanal during November 1939 while transiting from Brunsbuttel to Kiel after departing Blohm & Voss in Hamburg. Admiral Hipper loading mountain troops in Cuxhaven, Germany in preparation for Operation Weserübung, April 1940. The loss of Blücher during Operation Weserübung, 9 April 1940. Prinz Eugen moored at the Krupp Germaniawerft yards in Kiel, autumn 1940. Admiral Hipper in drydock in Brest, France, circa 1941. Admiral Hipper in Norwegian waters, circa 1942. The bombed out remains of Admiral Hipper in dry dock at Kiel, 3 May 1945. The ship's bell of Admiral Hipper resides in the collection of the National Maritime Museum in Greenwich, England. Both of Blücher’s anchors were salvaged from her wreck and are on display: this one in the harbor in Oslo, Norway; the other, farther down the Oslofjord near Drøbak. One of Prinz Eugen’s propellers, salvaged from Kwajalein Atoll and on display at the German Naval Memorial in Laboe, Germany. US Office of Naval Intelligence recognition drawing of an Admiral Hipper-class cruiser. Artist's rendering of Seydlitz with her conversion to a light carrier completed. This page was last modified on 19 February 2019, at 09:16. This page has been accessed 108,311 times.